I would have to have posted this topic to the blog when we were discussing Genesis. Nonetheless, I believe you all will find the content quite intriguing and interesting. 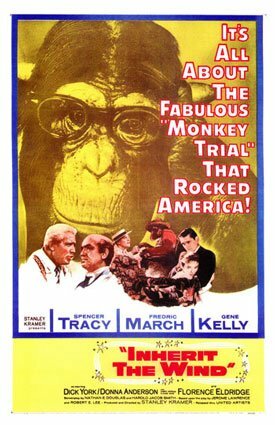 The 1960 film Inherit the Wind, accounting the 1925 Scopes Monkey Trial, touches on hot issue of Biblical Creationism vs. Darwinian Evolution which bitterly divides the scientific community from more fundamentalist groups. One theme expressed near the end of the film is that that the text of the Genesis and that of On the Origin of Species can reconcile and go hand in hand with one another. People on either side of the issue remain militant in their stance and the issue is still hot-button today. However, new archaeological and scholarly evidence may bring reconciliation into light, perhaps proving that Neanderthals, an evolutionary cousin and predecessor of modern humans, are accounted in the text of Genesis. So according to the Bible, the Nephilim were a race of humanoids, large in stature and without the soul which distinguished Adamic humans, with which they interbred and produced a hybrid humanoid race (Men of Renown), and that there were still Nephilim in Canaan when Joshua crossed the Jordan. While this account seems to be filled with myths and etiology, there are striking parallels with Neanderthals, a cousin species of Homo Sapiens who became extinct about 24,000 years ago. Archaeological remains show that Neanderthal Man was a hominid that was 20% larger in size than humans yet had much smaller brains and inferior intellectual capability. Neanderthals had existed millennia before the arrival of modern humans, but when Neanderthals encountered modern humans in Europe and Asia, they were unable to compete for resources with hominids so much more advanced. The demise of Neanderthals was their inability to develop a culture, and along with it the ingenuity to invent new technology and form civilizations. Can’t see the parallels between Nephilim and Neanderthals yet? Keep reading. According to the Bible and the other Semitic writings, the Nephilim had crossbred with humans and created a hybrid race. Surprisingly, this is also true of Neanderthals. According to mainstream anthropology, during the Second Ice Age, Neanderthals were migrating southeast from the prevailing glaciers of Europe and Homo-Sapiens were migrating North from their African origin. The two waves of migration first encountered one another in….you guessed it….what today is Israel. This is determinable by anthropologists and archaeologists dating human and Neanderthal remains found in Israel. But those aren’t the only remains they found. In the last 10 years, archaeologists have been uncovering numbers of skeletons in Israel that had both Homo Sapien and Neanderthal characteristics. In early 2010, anthropogenecists at Germany’s Max Planck Institute for Evolutionary Anthropology discovered that 4% of most humans’ DNA is that of Neanderthal. Both of these phenomenons are overwhelming proof that the two hominids interbred where they mingled. In Israel and other places, the product of this crossing was several offspring that exhibited hybrid characteristics. Let’s make a comparison: Both the Biblical Nephilim and the Pre-historic Neanderthal were of larger stature than their human cousins, they interbred with humans, creating hybrid offspring, and became extinct because of their failure to compete with humans ingenuity. These similarities transcend coincidence. Could it be that when the ancient Hebrew writers were writing about the race of giant Nephilim, they were indeed referring to the remnant of Neanderthals that humans encountered in the Middle East Region 24,000 years ago? Analysis of the scriptural parallels with anthropology and the archaeological evidence indicate the answer could very well be yes. I don’t know about the rest of you, but I found these founding to be incredibly interesting. I first heard of these findings on the television program “The Naked Archaeologist” on the episode called “Giants of Genesis”. The program airs on the History International Channel. In each episode, the host, Simcha Yacabovich, investigates the mysteries of the Bible and looks for concrete archaeological evidence to arrive at a conclusion. I highly recommend the program if you ever get a chance to watch it. But if not, below are some links which deal with the parallels between Nephilim and Neanderthals. 5 Responses to Neanderthals in Genesis? Read for the answer. I find this article fascinating, and provides proof for what I’ve believed for years. That science is only now catching up with what the faithful have known all along. It’s funny; I was just reading Genesis this morning and stumbled upon the Nephilim. I was familiar with them from the book of Enoch, but I had no idea that they also appeared in Genesis. When they described them, it immediately brought to mind the neanderthals. Thank you for both substantiating my assumption and providing such a well-written article.